Not yet. As I just said in that thread, I'll add support for it in the (hopefully) near future. The code already partially exists, actually, but i need to finish it. I've been pretty busy IRL lately but life should be slowing down soon enough so I hope to get a chance to add it. Palemoonxp cannot be installed. its running like a portable version. is that correct? in palemoon-forum they said: portable version not safe. Dont know how to install then. in Lavfilters app one can set the right codec or whatever setting. Well, now if it's all over but the re-naming.. I'll resubmit my previous suggestion as shortened by Destro - "Lunaris" for your version of Pale Moon; or maybe at this point "LunarFox" would be better since you now have to work back to Firefox from Pale Moon rather than the other way around (plus it should make for an interesting icon! lol). And possibly "Draconis" for Basilisk? Polls can be done. Just switch to the "Poll" tab after you click "Start New Topic." As for splitting the thread, dencorso will have to decide on that. My forum mod powers aren't global. But I digress, and if I continue this will be way off-topic, and pointless. Anyway, I'm glad to see that you're taking a more constructive approach. I just hope it is truly in good faith. Maybe something good can come of this, and we can avoid any more unwarranted negativity, here and elsewhere as well. I never dreamed there would be occasion to say this, but thanks! My unofficial installer is confirmed working with the latest builds for both new installs and in-place upgrades . As always, let me know if you guys find any bugs so I can fix them. can i also install NM 27.9.6 on SSE-pcs and how is the procedure? its now running like a portable. should i move the installer to NM-directory? Update: Have read that its not yet ready for Non-SSE2-pcs. I can't tell since I'm TMP user and I use session manager from TMP. if screen doesnt show anything pushing quickly off-button(on PC) will revive screen. I like how PMXP is restoring open tabs(after freezing) even leaving text which one has not yet finished. But i never had a freezing rather a crash, very seldom, it maybe depend where one is surfing. Yes there are websites where one must shut down scripts to get out of freeze. I was most surprised by the fact that -other than in FF-PMXP (after resetting had been done) is fully recovering addons. in FF they were "lost". PW and favorites always recovered there. Always had to recover addons with the help of FEBE. version 10.3 is latest working with PM27. When PMXP is getting slower and slower, above all in Facebook, then its time for a reset. maybe oversaw the trigger earlier. Installer actually working on SSE2-processor-PCs but but not yet on SSE(Non-SSE), right? So how do in install PMXP 27.9.6 its behaving like its a portable version? IS it a portable only version? You made a typo in the links to your Pale Moon 28 builds. anyway... my server is updated to link correctly to the new builds, enjoy. No need to download a new installer version this time. have just found a newer than 27.9.4.6847(below) version. from march 16-2019.
which one is newest and what is wrong with naming? i opened yesterday already a new thread about that. 2. What for is a browser-installer? I am still struggling with downloadhelper not working in YT or elsewhere. DL only when logged in. wrong version? other workaround?-SSE-Winxp here. How does this make any sense? I help create the future. Hell, in many ways I created a lot of what you see these days. What am I following? Nothing, except my own vision. I am indeed a trendsetter. You do know it was my pushing things along that contributed to the reality you now experience especially with the abused software you are getting from Roytam. A lot of it would not be as it is without me. Which is why I am somewhat protective of it. Of course if he WASN'T a moron he would properly re-brand his efforts and not fall back on false attribution of his corruption. Is there perhaps a different tune you can play because this one is quite worn out after two+ years. 2. Do you have a better SSE-winxp-version of Palemoon than Royam? its quite stable and i am running it on an old 3gb Ram-200gb-hdd. Have you tried installing the K-Lite codec pack, or downloading the DLLs from here (see first post if you need nosse version) into the directory where palemoon.exe lives? I haven't personally used the browser on win2k that much but that's my guess. Lavfilters often saved me. one can DL the exe somewhere. Plus: FFdshow, MP4Splitter, Xvid(VidX), FLVSplitter. to make WMP running all filetypes. other issues cannot be discussed here but i know a lot of workarounds if videofiles are not running in winxp or win7. For for the builds based on Pale Moon and Basilisk the issue is that using the generic branding and then in the same sentence calling it "Pale Moon" and "Basilisk" everywhere creates massive confusion this is the false attribution and representation of whatever it is Roytam wants to produce. He and his cohorts refuse to create unique branding for it and continue to refer to it as "x for Windows XP" linking his builds to us. The same can be said for Binary Outcast projects except while Interlink has complete renaming to not cause confusion he again attributes this unauthorized build as Binary Outcast's Interlink.. In the case of the navigator.. It isn't even a finished product and he is shipping it out again with attribution but because it IS unfinished I have not yet made clear unofficial branding to differentiate it from the product I am producing. Additionally, as it is an UNFINISHED and currently UNRELEASED project it still has Mozilla Copywritten and Trademarked assets in terms of the Mozilla Suite Icons and SeaMonkey logos and icons that I have not yet replaced. The MPL gives him the right to take the source code and do what he likes with it according to the license but that ONLY applies to the source code that matches a binary form in question. Additionally, attributing his work based on my projects IS improper use of MY trademarks and general rights which are NOT extended to him. He is doing material damage by linking his builds to me AND he is doing materal damage by using my trademarked product name of Borealis in the actual resulting binary which the MPL strictly does not extend rights to. He is also doing damage to Mozilla for which there is copywritten and/or trademarked assets he is distributing. THIS has ALWAYS been my problem with Roytam and his friends. Instead of creating something of their own they do the minimum amount of work possible and wobble back and forth across the line of rights infringement to produce these builds for which they get acclaim from people like you from but when something goes wrong it falls to us to clean it up. As I also said, it also causes confusion with users. MCP has basically washed their hands and ignores Roytam's builds but my self as Binary Outcast, I want Borealis-based builds of the navigator to be pulled immediately from his archives as rights infringing material not only of my self but on behalf of the SeaMonkey Project and Mozilla until such time the project achieves first release, provide non-infringing unofficial branding, or he creates his own. As for Interlink-based builds I want all mention of the Interlink trademark removed from the associated sites and repositories OR and FOR the future there is a clear disclaimer that these builds are not in any way affiliated with Binary Outcast. IF these provisions are met I will cease my current activity and allow you to continue on as before without interference. Main question still unanswered: Can you deliver a stable or almost stable browser for SSE-based Winxp-PCs? who likes playing youtube and is able downloading videos? @3dreal, you realize this isn't Twitter, right? You can actually put all your concerns into one post! You don't have to post a "tweet storm"
The latest version of NM 27 is here: Don't sweat the version numbers. Go by the date (2019 Mar 16). Just because there's no installer (yet) doesn't mean it's a portable version. A portable version stores its profile within its own directory, so you can launch it from a thumb drive and your profile will be on the thumb drive as well. New Moon doesn't do that. Don't sweat what's said on the PaleMoon forums. As they will emphatically tell you, New Moon is not Pale Moon (even though it's derived from it). Many folks there don't much care for @roytam1's work, but many folks here are quite happy with it. For video playback issues (in Facebook or wherever), read the FAQ in post 1, especially where it says "Can't play h.264 clips" & "VP9 support:" If it still doesn't work, post back here, but be patient: some of our most talented followers don't necessarily read this thread each day. Probably no easy fix, other than switching to one of those browsers. Thanks for the input. I may switch to a Firefox 52 fork right away, but Serpent/NM/MyPal are all Palmoon based, which was forked from Firefox 24 as I read, and may not compatible with add-on I use. Is there anyone working on a Firefox 52 fork? It could incorporates important bug fixes only. Serpent 55 was forked from an alpha version of FF 53. Note that FF 53 does not support most plug-ins, such as Java. PM/NM 27 was forked from FF 31, IIRC. Not sure about earlier releases (e.g., PM/NM 26.5). Thanks for the clarification of my misunderstanding. I'll try them with my Fx52 profile and see if anything broken. I just tried the Win2000 build on my ancient quad Pentium Pro 1M 200MHz machine, literally Intels' first 686 processor. So there is no SSE2, no SSE, no MMX, just plain 686; And it works perfectly fine. It's very slow of course, but it does work! Off topic here of course, but while we're talking about browsers to possibly replace FF 52 ESR, do any or all of these browsers sync with versions of Firefox using the Mozilla sync system? I have other Firefox installations, all of which are the latest version on my phone and on Windows 8.1 and Windows 10 computers, and I wouldn't want to lose bookmarks, history and password sync with them if I went to another browser on Windows XP. do any or all of these browsers sync with versions of Firefox using the Mozilla sync system? That's a good question. Older versions of Serpent do. Newer versions, however, sync with Palemoon's system (called Weave), as does NM of course. (The Palemoon team has been trying to make Basilisk more independent of Mozilla's infrastructure. That also applies to the add-ons Web pages.) I think the switch was made around December or January; I'll have to look to be sure. From a technical and privacy standpoint, I think Palemoon's sync is better, but that does you little good if most of your other browsers use Mozilla's sync. BTW, I now use @roytam1's Serpent even on Windows 7, but not because of sync. It's because, since (IIRC) version 56, FF requires WE versions, while Basilisk doesn't support WE versions. But Serpent supports both, as does FF 52.9.
i tried another one but i cannot start. Have great success with Maxthon 3 but only Maxthon 5 has videodownloader. will hardly with with SSE(non SSE2).Most interesting: has day/night-mode. in night mode facebook verification-window hidden! Thanks @Mathwiz, I'll have a look at that version of Serpent and see how it goes. I'm not thinking I will abandon FF52ESR imminently. The Instagram video issue is annoying, but I can obviously still view them on my phone or on other browsers (including Google Chrome 49 on XP!) so it's not the end of the world. If other sites start breaking though, I will have to reconsider. Yes. Silently, because there wasn't much to say about it. You're welcome! As @Sampei.Nihira said, it's often good to have multiple browsers for situations like this. 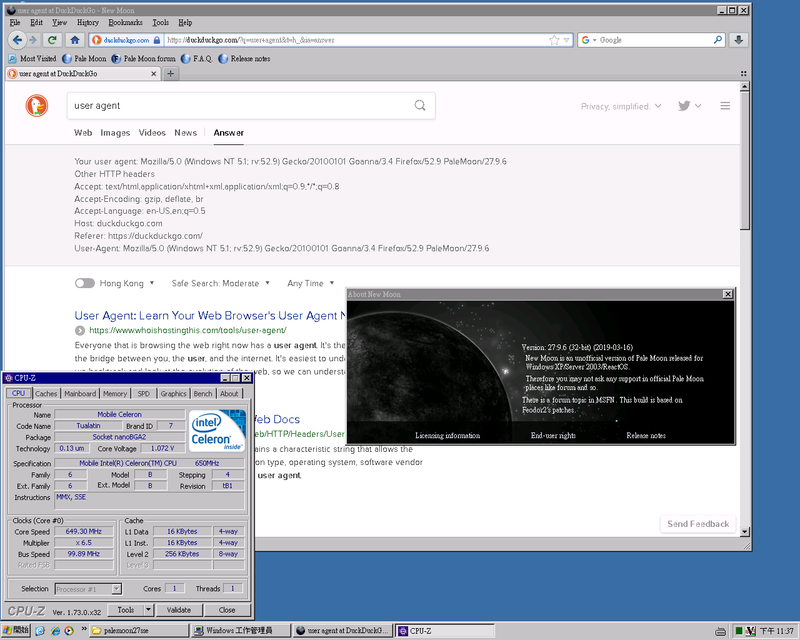 I have Serpent 52, Serpent 55, NM 28, Seamonkey 24.9.5, FF 52.9.1, Advanced Chrome, Opera 12.18 ... and IE8 of course. So far Instagram videos are the only thing I've found (aside from DRM issues) that spoofing another FF version (sometimes newer, sometimes older) can't fix. I wish FF had site-specific user agent overrides (the pref is there and defaults to "true," but it doesn't seem to work), but one can get around that with an add-on. Over time, JS / CSS issues are likely to become more serious for browsers that aren't being updated. I don't know how MCP will deal with future JS changes that have to be ported to PM / Basilisk from newer FF versions, but they seem to have gotten pretty good at it. As long as the necessary patches can still run on XP, we should be fine. I was surprised to find Seamonkey doesn't show Instagram videos either. Haven't yet tried BOC (based on Borealis (based on Seamonkey)) though.